The legendary singer turned up on the TV talent show earlier this month to sing Real Wild Child while writhing around shirtless and shimmying up to judge Jennifer Lopez. But he said he had to do the show because, even though he isn't a fan, he's even more criticial of people "who lurk in the shadows" complaining about it. He added: "I was informed very quickly by people who love me and care about me that if I went on the show, everybody who liked the show was going to hate me and everybody who liked me was going to hate me for doing that show," he said. "I'm kind of a stubborn person, so that just made me really determined, 'I'm going to... do it anyway!'" 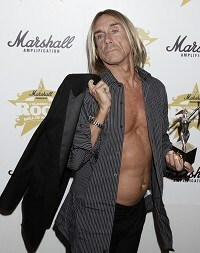 Iggy's next project is to return to Michegan, where The Stooges were formed, to pay tribute to his late band mate Ron Asheton in an ambitious show.